Next week’s visit to Italy by Chinese Premier Xi Jinping has nearly everyone jittery. The recent announcement by Five Star Movement Leader Luigi Di Maio that his country is prepared to sign a Memorandum of Understanding with China to be a part of China’s ambitious Belt and Road Initiative has set off a firestorm of response from Donald Trump to Angela Merkel to Di Maio’s own coalition partner, Lega leader Matteo Salvini. But, don’t let the wrapper fool you on this. Di Maio’s announcement I don’t think it ‘blindsided’ Salvini as this Reuters article suggests, as much as Merkel and Trump. Even though Geraci is a member of the League, the group appeared blindsided when news of an imminent deal emerged last week, with party chief Matteo Salvini warning against the “colonialization” of Italy by China. If anything, this announcement is a smart move by Di Maio. It puts Salvini a bit on the defensive who has been setting the tempo for the coalition recently. Salvini needs Trump on his good side to assist him in taking on Merkel and the European Union. Merkel is trying to play hardball with Trump over energy issues, as I discussed in a recent article, by defending the Nordstream 2 pipeline from U.S. aggression as change the board state of geopolitics. 2. End U.S. occupation of Germany. 3. Secure Germany’s energy future, which also secures its political future as the leader of the European Union, by stitching together the continent with Russian energy arteries — Nordstream 2, Turkstream. 4. Manage the shift away from NATO as a controlling force in Europe’s relationship with Russia which doesn’t serve Europe’s long term purposes. This while Trump and Xi are deep in the weeds on a trade deal that the entire world is watching the outcome of with bated breath. Hint: Trump will fold. The EU just put off talks with the U.S. over the same issue, failing to deliver an opinion on whether to re-open trade talks with the U.S. In a confusing vote, the European Parliament passed by a narrow majority a series of amendments against beginning talks, but then voted down its own resolution on the topic, meaning in effect it took no view. The resolution would not have been binding, but parliament will have to approve any deal agreed and EU governments said they wanted to hear the view of lawmakers before deciding. Because everything with the EU is so crystal clear on a normal day, right? Now, Di Maio comes in and takes a major meeting with Xi looking for billions in Chinese investment to jump start Italian economic prospects. Trump is already apoplectic over Nordstream 2 and is threatening to sanction some of the biggest companies in the world for being a part of the project. But, that ship has mostly sailed. The pipeline is over 70% complete. About all the U.S. can do now is get the EU parliament to stop the pipeline delivering gas, wasting €11 billion building the thing. Like with Brexit or Crimea, there comes a point where those in opposition to something in the world they don’t like has to be accepted as de facto. Unfortunately, the insane people who think they run the world won’t give up as long as there are lawyers to be deployed to complicate things. This is why I love Di Maio’s move here. Trump is engaged in a trade war with China while complaining bitterly about Europe doing business with Russia. He’s even threatening them with a bill for housing our troops that we don’t want to remove. Di Maio says Italy would be a great fit for China’s Belt and Road Project, which the U.S. is actively undermining all across Asia and the Middle East. While at the same time he is thumbing his nose at Merkel who doesn’t want Italy to feel empowered on any level as they enter the European Parliamentary election season. Euroskeptics could take as much as a third of the seats, even without a hostage U.K. contingent. Stand firm on Nordstream 2, try to save the JCPOA, on the one hand, but support the U.S.’s idiotic regime change operation in Venezuela to appease Trump. This is a strong statement of independence by Italy as they join Hungary, Poland, Greece and Portugal, who all have MOU’s with China. And it’s not like Hungary and Poland are high on Merkel’s Christmas card list. Both are dealing with Article 7 proceedings to strip them of their EU voting rights. From every angle it throws a wrench in the works internationally while being good politics domestically. 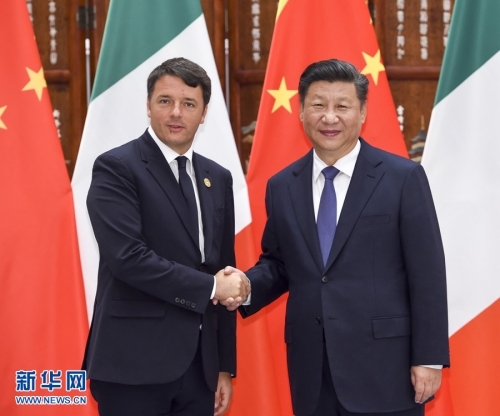 If Xi leaves Rome without a deal it doesn’t necessarily mean Italy caved to outside pressure from Trump or Merkel, as much as it could signal that Xi simply asked for more than Italy was willing to give at this point. And both sides realized that they were being used by the other as leverage with the people not in the room. Regardless, Xi coming to Rome and meeting with these European outsiders is a great statement on his part that China knows the imperial game Merkel and the Gang in Brussels is playing in the long run. Join my Patreon and subscribe to the Gold Goats ‘n Guns Newsletter where geopolitics and portfolio management meet to help you navigate a very difficult period of history.